We’ve been in our new house for almost a month now and it is finally time to get serious about the very first project I wanted to do…..painting our front door! It is currently painted red (which I actually love red doors). But it has to go. For two reasons….. The first being there was so much red in the house already and when we first saw it, the RED was overwhelming!!! All the floors on the first floor are cherry wood so they have a red tone to them. The living room fireplace was also all red brick which we just painted white (this made a huge difference!). 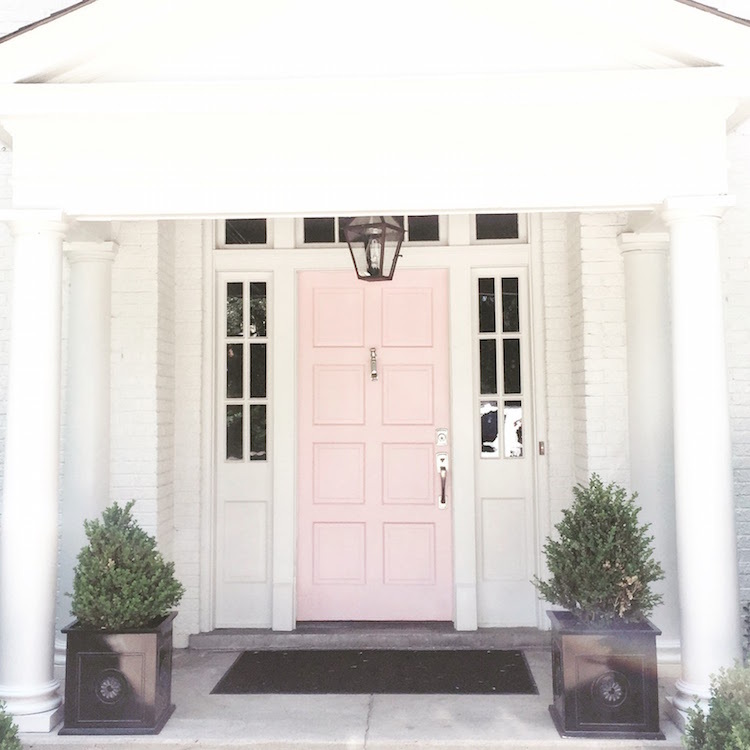 Through traveling, I have fallen in LOVE with houses that have pink doors. 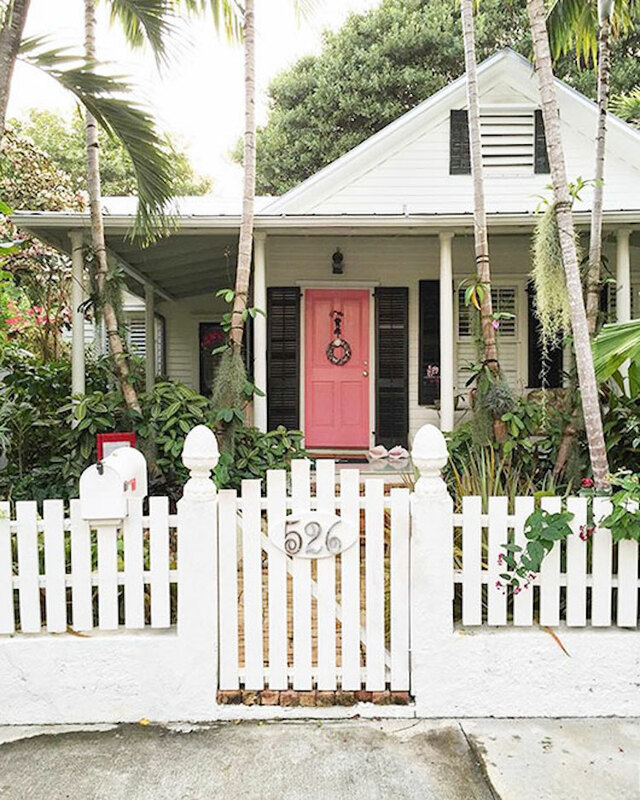 Especially the white houses with pink doors so this was a no brainer when it came to a color choice. I’m still giddy that Eric was on board with us painting the door pink. It took a little convincing but this is our very first house we own and the first time we can actually make fun changes like this! It was easy to narrow down the paint colors with Farrow & Ball. You can’t go wrong with their color choices! They have 132 color options so you don’t get overwhelmed with choices. Also, the colors from Farrow & Ball are ALL beautiful. Unlike other paint companies, they really focus on quality over quantity. Below are 6 paint color choices I have in mind, plus some inspiration photos. I’d love to hear your thoughts on your favorites! 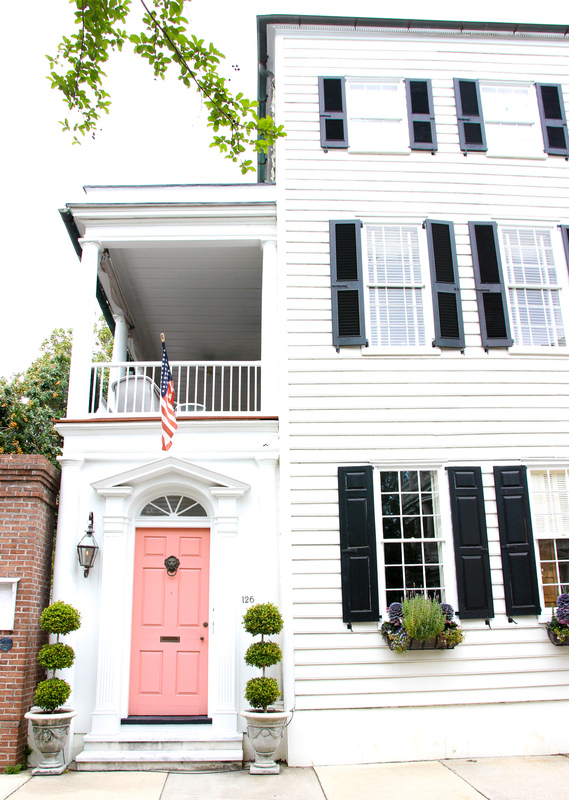 Every time I visit Charleston, I dream of living in this house. Fun fact, we actually put an offer in our house a few minutes after I snapped this photo! Image via the intagram account of @Victoriametexas . 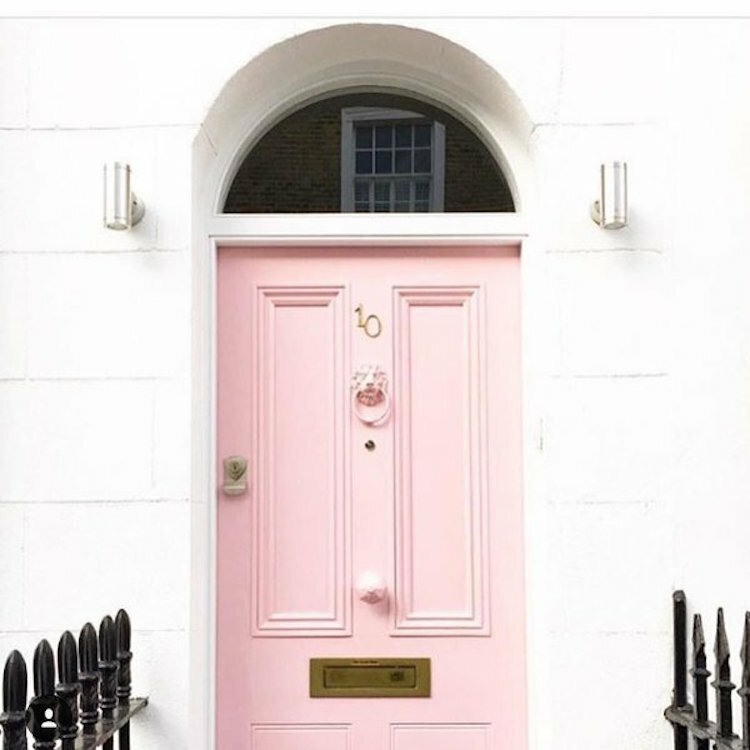 She’s a fashion blogger in London and her feed is filled with so many beautiful pink doors! 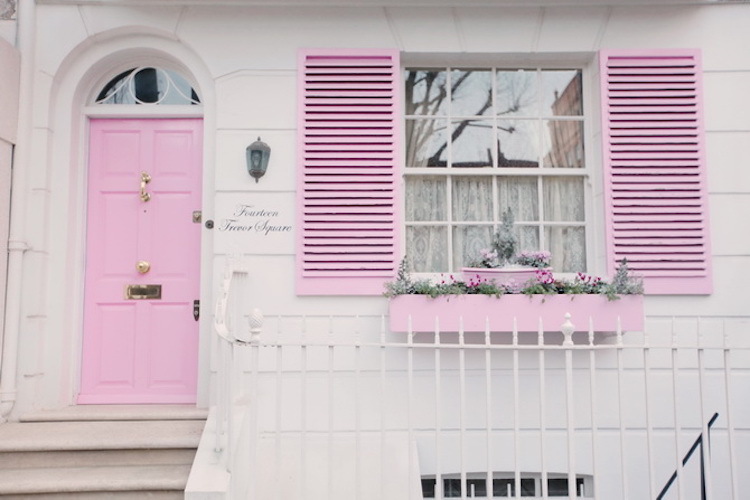 The Cherry Blossom Girl found this house, with pink shutters and a pink planter box to match the door. Image via the instagram account of @elsielarson. If you love this, you’ll love her recent bathroom renovation! 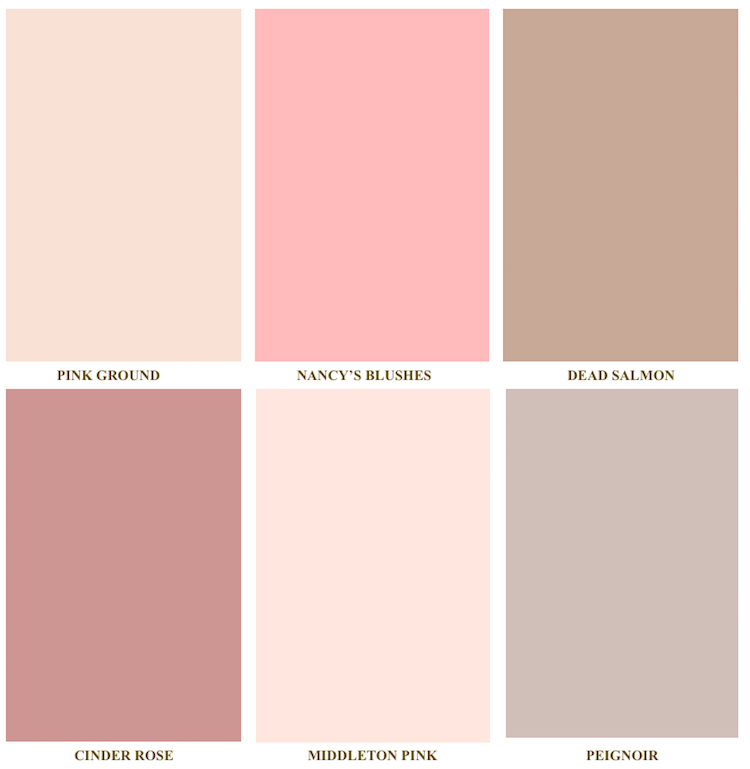 Peignoir (bottom right) is described as a romantic gray pink… and I LOVE this color on the screen and in person. It’s a little less pink than I originally wanted but it is at the top of my list. Pink Ground and MIddleton Pink are gorgeous as well but after putting the samples up, they are much too light. Dead Salmon is an “aged salmon pink” which looks quite nice in real life. It’s not a show stopper color but a classic shade for a front door. Cinder Rose and Nancy’s Blushes are two top contenders as well! I agree with Stephanie. If the idea is to go the pink route, that color is the clear choice! It is the truest pink! Thank you!! Oh I just love all these houses! And the color options are beautiful. Thank you Virginia! You can’t go wrong with ANY of the colors from Farrow & Ball! 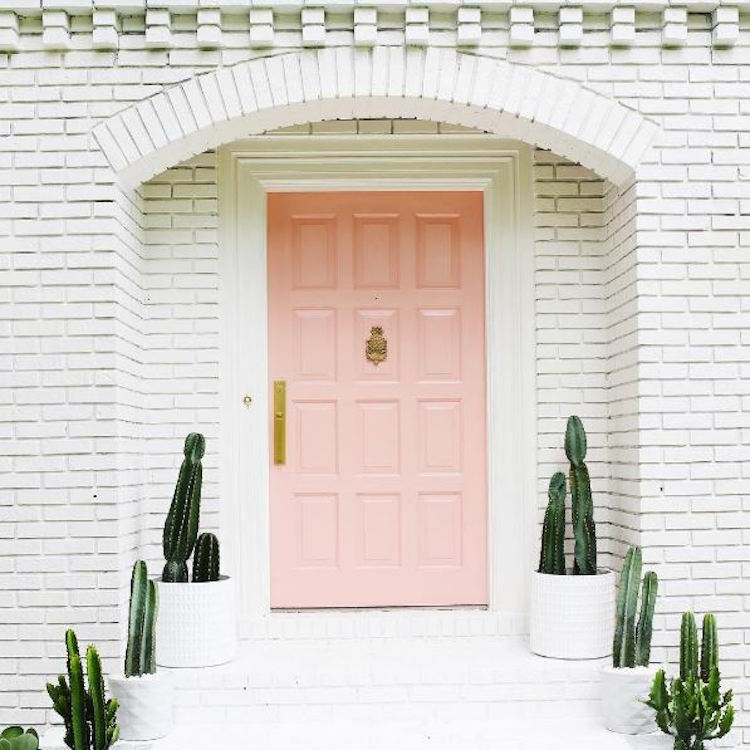 Love these pink doors! I can’t wait to see which one you choose! Pink Ground is my favorite after seeing your inspiration pictures!